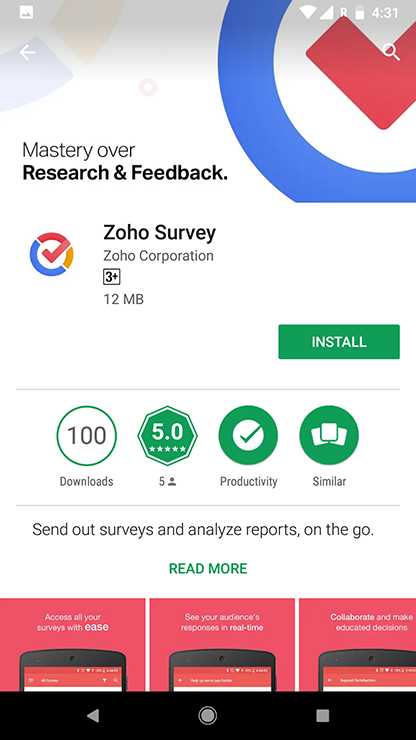 To help you access your surveys and collect responses on the go, we're elated to announce the launch of the first-ever mobile application for Zoho Survey. How can I get this application on my phone? Our app is available on iPhone and Android devices. You can download the android app from Google Play Store. What comes with this release? 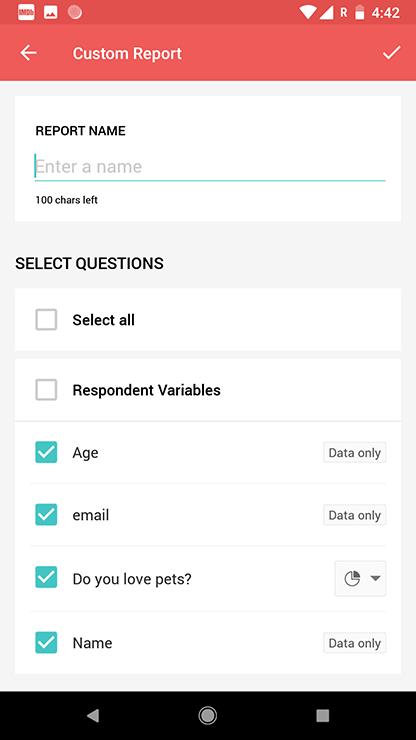 Currently, you can use the application to launch and close surveys, or to view reports. Install the application on your android mobile device. Sign in by using your Zoho Corp credentials. You will be taken to the All Surveys page. All the surveys you have created will be listed on the All Surveys page. 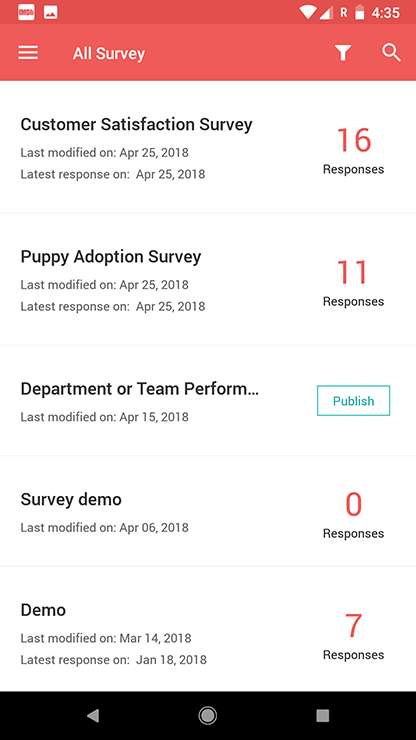 Published surveys will have the survey modified date, latest response date, and total number of responses displayed along with the survey names. 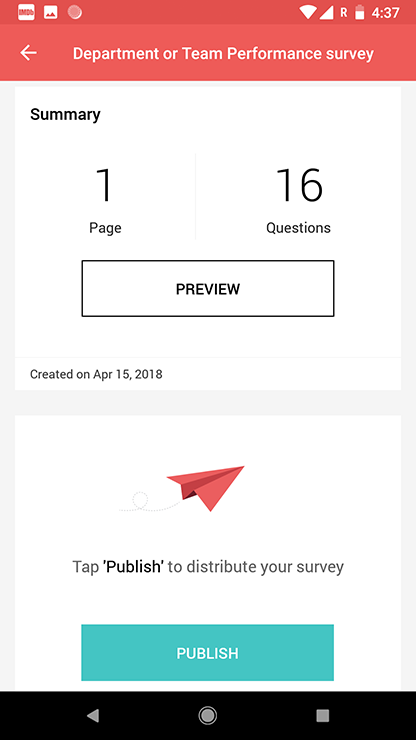 Surveys that are yet to be published will have the survey creation date and a Publish button prompting you to launch your survey. The dashboard provides you with all the information regarding your departments and surveys, all in one place. There are quick access links to various functionalities of the application from a single screen. Departments, or groups, are specifically designed for teams to collaborate on surveys. 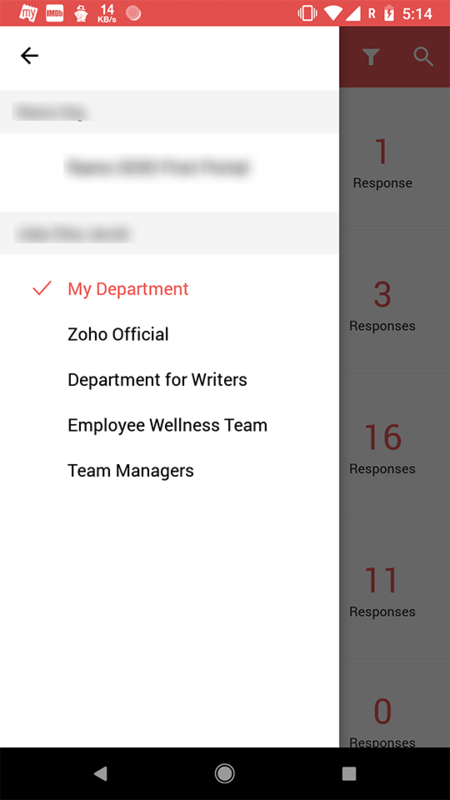 With Zoho Survey, you can create and maintain departments and user accounts, and share surveys and reports with the organization members. However, these are features that are exclusive to Enterprise customers. How do I select a department? Tap on the All Surveys page. Tap the department in use. You'll be able to see a list of all the surveys in the selected department, as well as the departments you are a part of. You can find the total number of surveys, the number of published ones, and the number of draft surveys in this department. 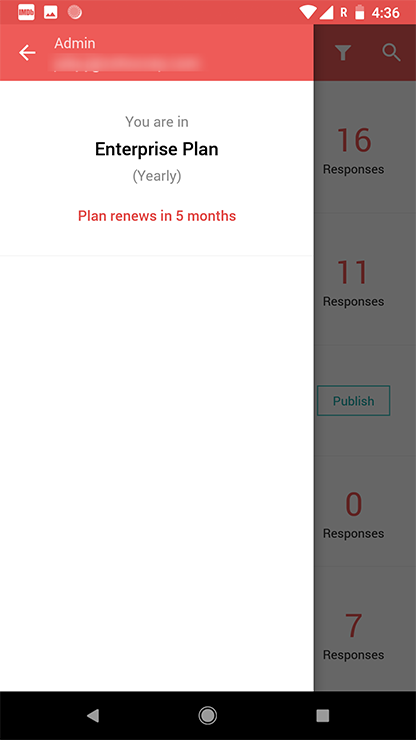 Tap the Settings icon to see which plan you are in, and to find out when you need to renew your current plan. Tap and tap Shared with Me to take a look at the surveys that have been shared with you. Published surveys will have the name of the person who shared the survey with you, the survey modification date, the date on which you received the latest response, and the total number of responses displayed along with the survey names. 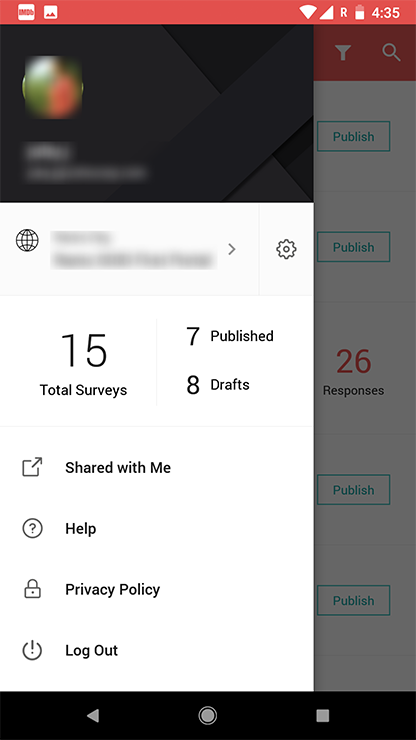 The ones that are yet to be published will have the name of the person who shared the survey with you, the survey modification date, and a Publish button prompting you to launch your survey. 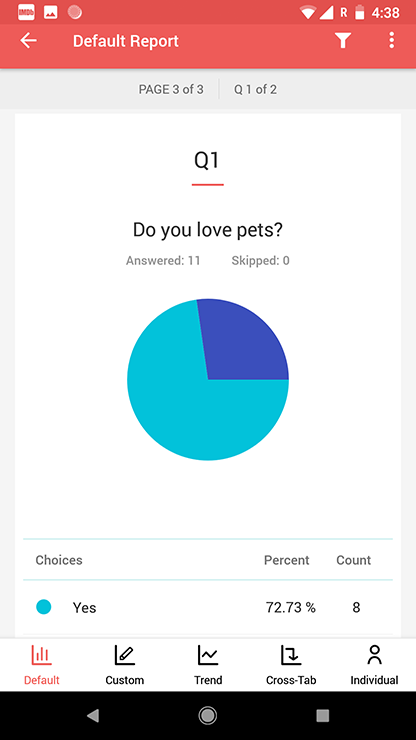 Tap the surveys to see a summary of the survey. Tap Help to read our user guide. The help section has detailed step-by-step instructions you can follow to make your survey creation process hassle-free. Tap Log Out, then tap Yes in the confirmation box that follows to move out of the application. 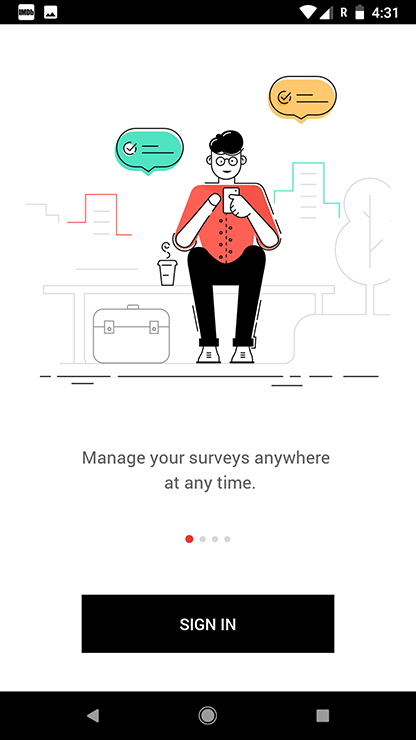 Get updates about your responses in real time with Zoho Survey's reporting tools to analyze the trends and make better business decisions. Customize reports and set up a schedule to deliver them, or compare different reports and filter your responses by the criteria you set. You can view a summary of all responses, or view them individually. How do I view the reports of a survey? Tap the published survey you want to select on the All Surveys page. Tap View Report to view the report in detail. Type a name for your filter in the Name field. 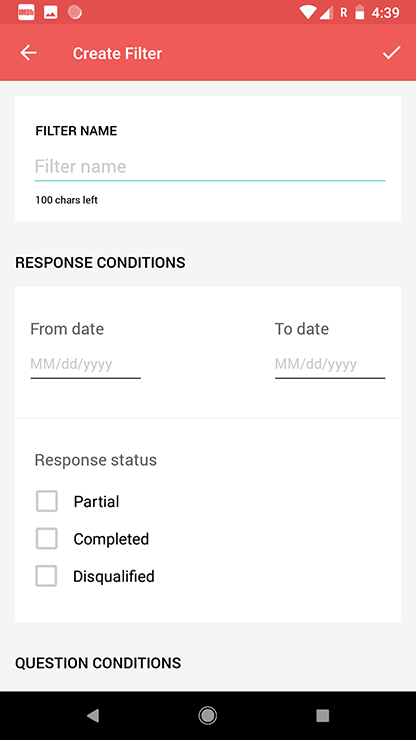 Tap From date and To date to select a time range in the Response Conditions section to view the responses in a particular time period. Tap the checkboxes to select the response status. Select Disqualified Responses if you want to filter and view the responses that do not fit your specific criteria. Read more on this. If you have multiple collectors, tap the Collector List dropdown to select collectors for your filter. If you have only one collector, it will be selected by default and this field will not be displayed. Tap Add Condition and select questions to set a logic for your filter. Tap All if you want to match all the conditions, or tap Any if you do not want to match any of them. Tap the tick icon. Your new filter will be added to the filter options. What are the different kinds of reports? 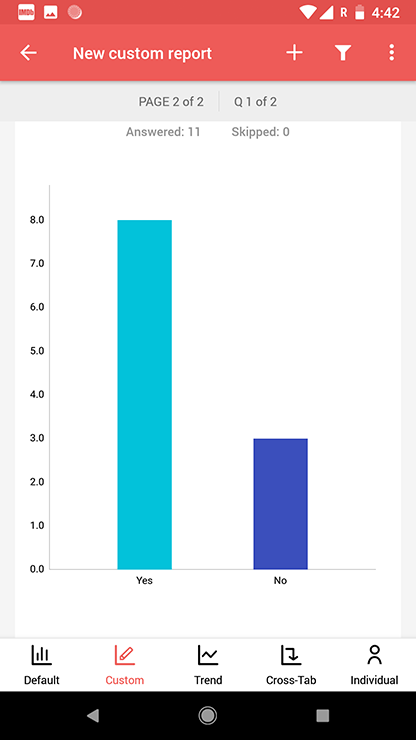 The default report displays a detailed report for each question in charts and figures. Tap when you are in the reports view to view the default report. You can select the questions that you need and create custom reports. This report can be shared with your colleagues and can be selected under filters to view the responses for a selected set of questions. Tap in the reports view to navigate to the survey’s custom reports. Tap the down arrow in the top banner and a list of available custom reports will be displayed. Tap the custom report you want to view. How do I create a new custom report? Type a name for your report in the Name field. Tap the checkboxes to select the questions, variables, and other reports you would like to include in your custom report. 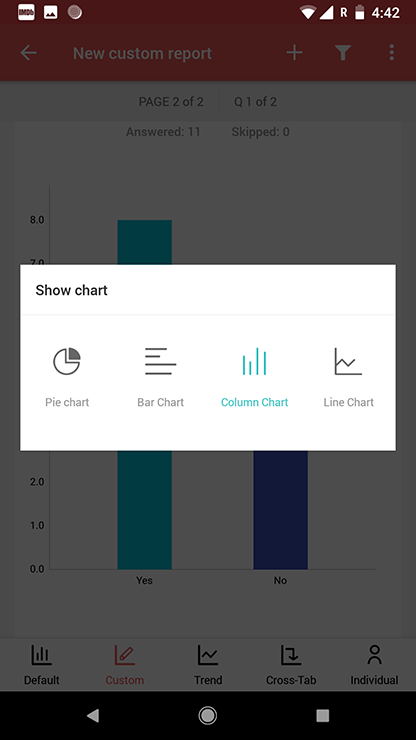 Tap to change the chart type for any closed-ended question. Tap the tick icon to save. Your new custom report will be added to the dropdown list of custom reports. Trend reports show you the changes in the responses you receive over a particular time period. The default trend reports will show you the changes until today, by day, week, month, or quarter. How do I view the trend reports? 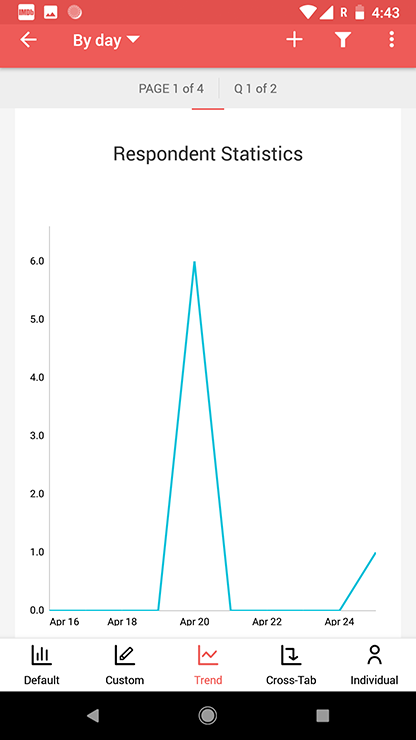 Tap in the reports view to navigate to the survey’s trend reports. 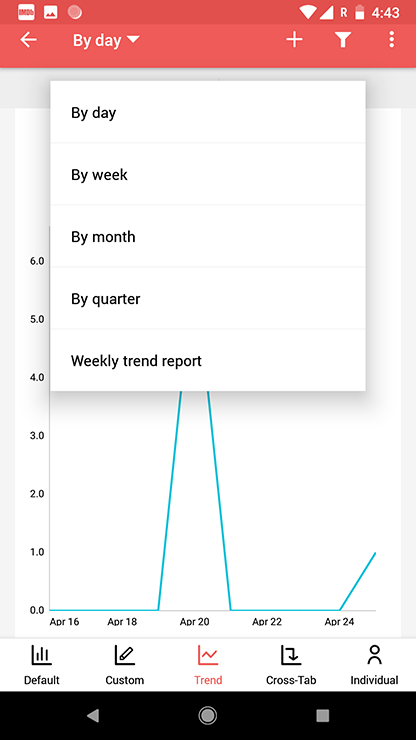 Tap the down arrow in the top banner and a list of available trend reports will be displayed. Tap the trend report you want to view. How do I create a trend report? 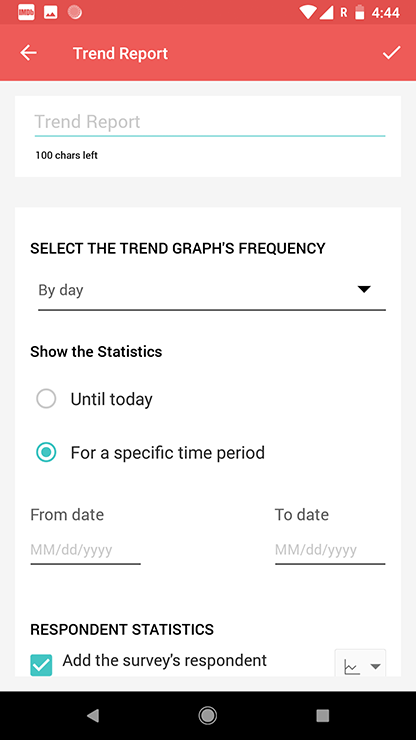 Tap to select a trend frequency for your graph from the dropdown. 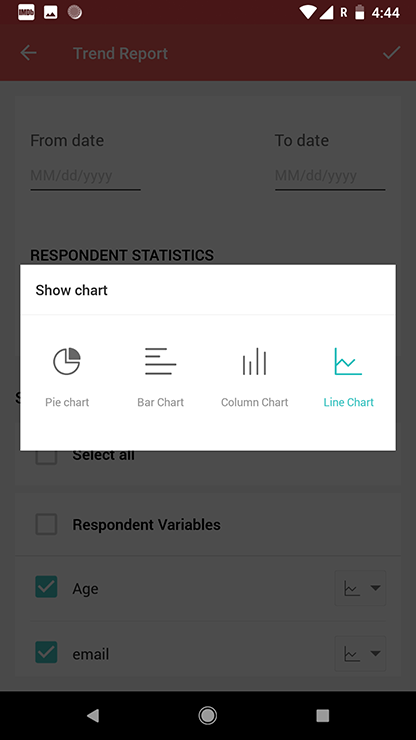 Tap to select a trend statistic date range. 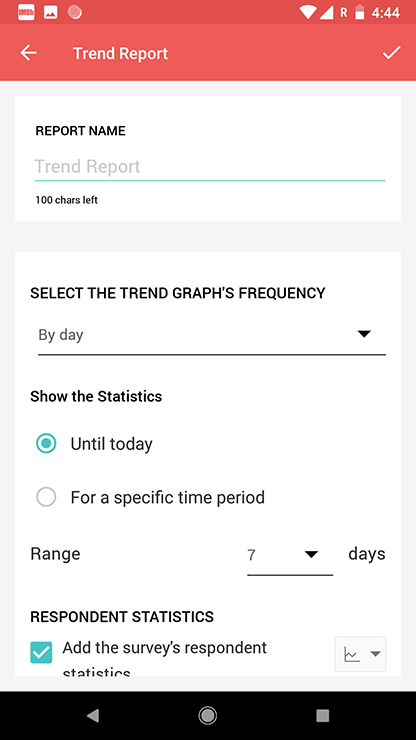 Tap Until today to display the trend statistics through the present. Tap the Range dropdown to select the range. Tap For a specific time period to select a time range. Tap the Addthe survey's respondent statistics checkbox to include these statistics in the report. 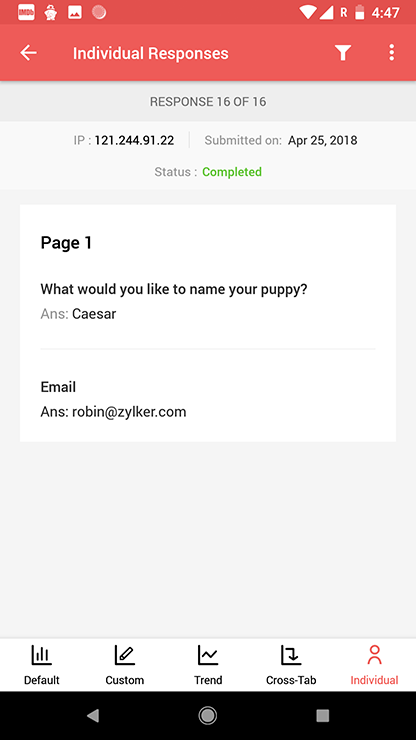 Tap the page number banner to select the variables and questions you want to include in the report. 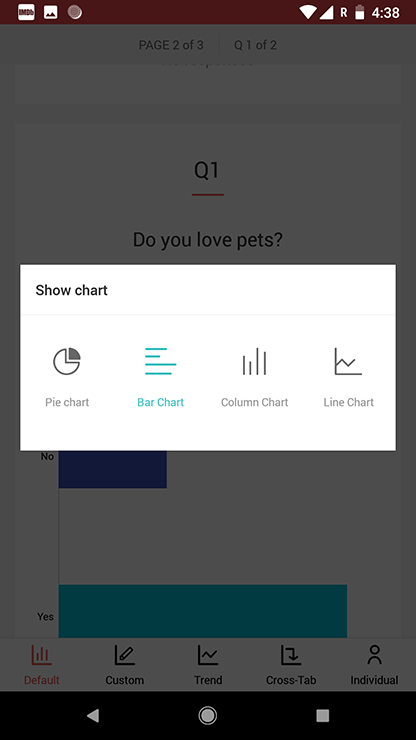 Tap to change the chart type for any question. Tap the tick icon to save. Your new report will be added to the dropdown list of trend reports. Cross-tab reports are used to compare two questions and analyze their correlation. These reports can be shared and can also be selected by filter to show the data. How do I view cross-tab reports? 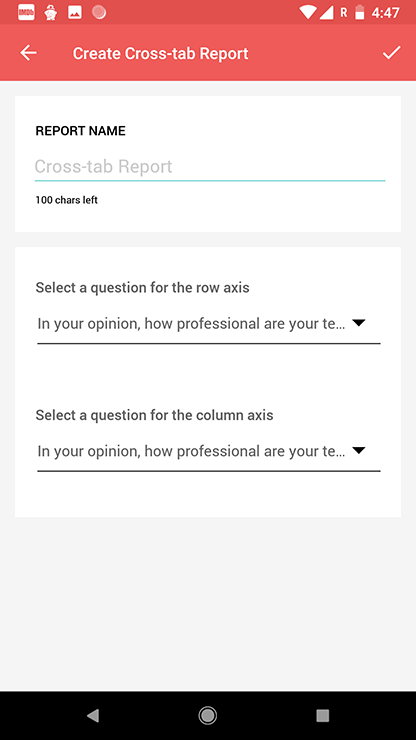 Tap in the reports view to navigate to the survey’s cross-tab reports. Tap the down arrow in the top banner and a list of available cross-tab reports will be displayed. 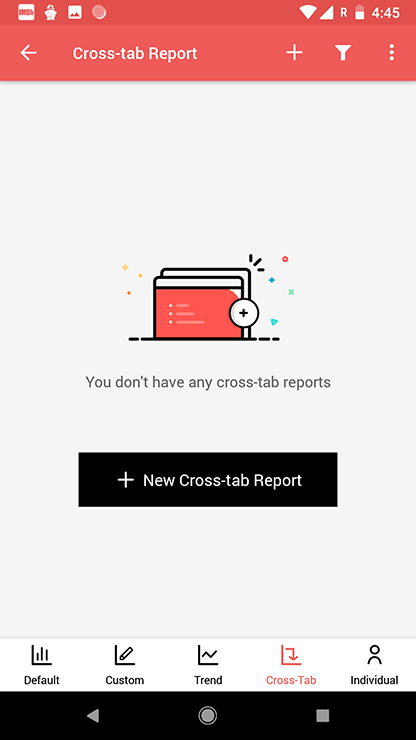 Tap the cross-tab report you want to view. How do I create a cross-tab report? Tap the dropdown lists to select a question for the row axis and another for the column axis respectively. Tap the tick icon to save. Your new report will be added to the dropdown list of cross-tab reports. You can view the individual responses for each of your survey questions in this section. The respondent's IP address, and the date they responded, and the completion status of the responses will also be displayed here. If the respondent hasn't answered a question, it will be shown as Skipped. How do I view individual responses? 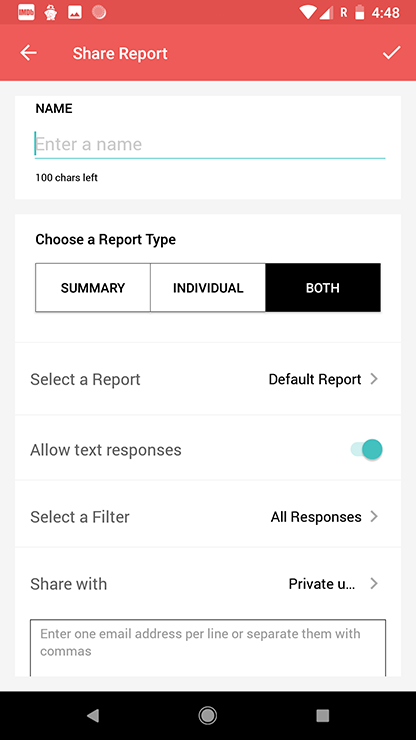 Tap in the reports view, to navigate to the survey’s individual responses. Share your reports with colleagues, survey respondents, organizations, or the public. You can also secure shared reports with a password. Tap in the reports view, and select Share Reports. Summary - Tap this option if you just want a summary of your responses. Tap Select a Report and tap to select the report you want to share. Tap to enable or disable the option to Allow text responses. When enabled, it shares the text responses to open-ended questions with your report's summary. These options will not be available if you select Individual sharing. Tap Select a Filter to select a filter. Tap Sharewith and select an audience. Share with private user: Tap this option to share your report privately with individual users by typing the users' email addresses. Once the survey is shared, an email will be sent to the user with the survey link. 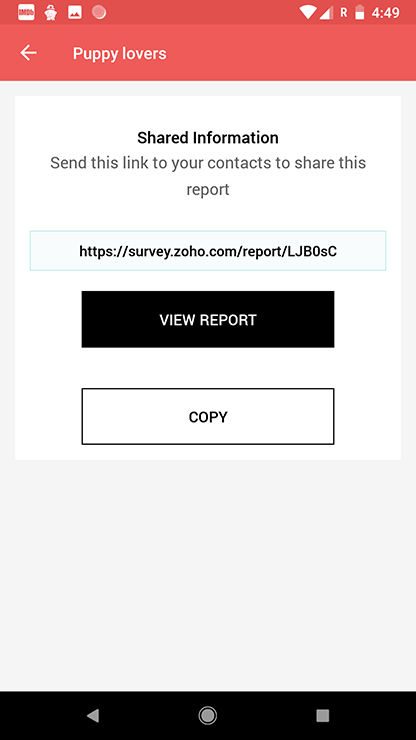 Share with the organization: Tap this option to share your report with your organization. Share with the public: To make your report publicly accessible. Search engines will also be able to crawl this report. 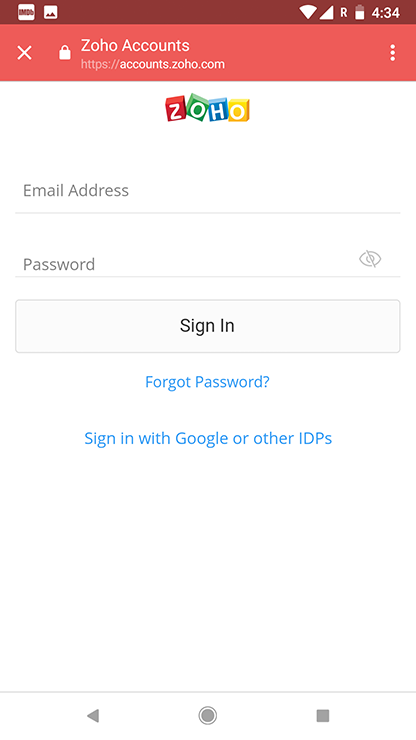 Share with password: Tap this option to secure your report so that only users who have the password can access it. Type your chosen password into the Enter Password field. Individual - Tap this option to see the details of each individual response. Share with: Tap to select an audience. Both - Tap this option to see the summary and the individual response details. Tap Share with and select an audience. Share with private user: Tap this option to share your report privately with individual users, and type the users' email addresses. Once the survey is shared, an email will be sent to the user with the survey link. Tap the tick icon to save. A web link will be generated. Tap View Report to view the report in the browser. Tap Copy to copy the web link. Tap Share and select the applications that appear in the pop up to share your survey through various social media platforms or applications. How do I edit a shared report? 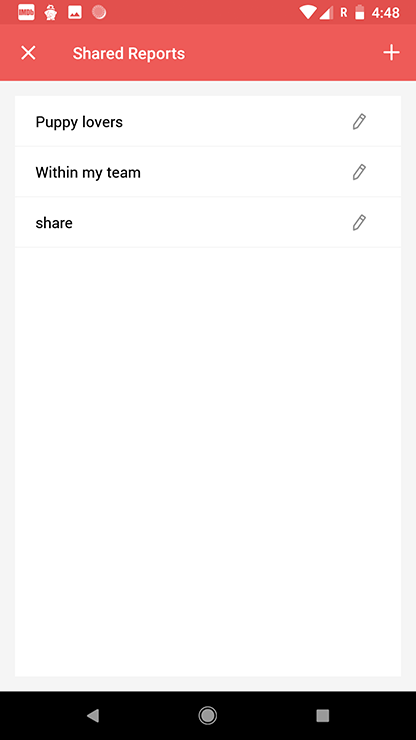 Tap in the reports view, and select Share Reports. A list of shared reports will come up, if you've created them before. Tap next to the shared report you want to edit. Tap the tick icon after you have edited the report. How do I view a shared report? Tap the shared report you want to view the link of. The web link of the shared report will be displayed. How do I delete a shared report? Tap next to the shared report you want to delete. Schedule your reports to be delivered to specific users daily, weekly, or monthly. Tap in the reports view, and select Schedule Reports. If you haven't created a scheduled report before, tap +. 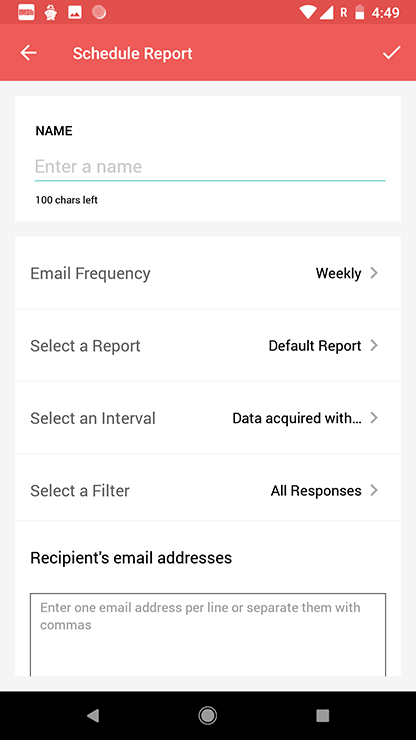 Tap Email Frequency to select a frequency to email your reports: Daily, Weekly, Monthly. Tap Schedule a Report and select the type of report you want to schedule. Tap All to receive all responses. Tap Data acquired within frequency interval to receive responses for a specific time period. In the Recipient's email addresses box, type the email addresses of the recipients, one per line or separated by commas. How do I edit a scheduled report? Tap in the reports view, and select Schedule Reports. A list of scheduled reports will come up if you've created them before. Tap the scheduled report you want to edit. Tap the scheduled report you want to delete. Tap and tap Delete in the confirmation message that follows. 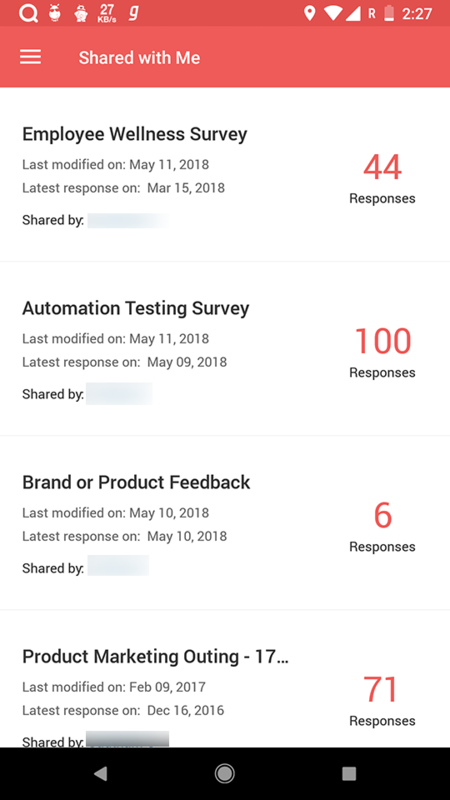 Delete the responses of your survey in bulk. 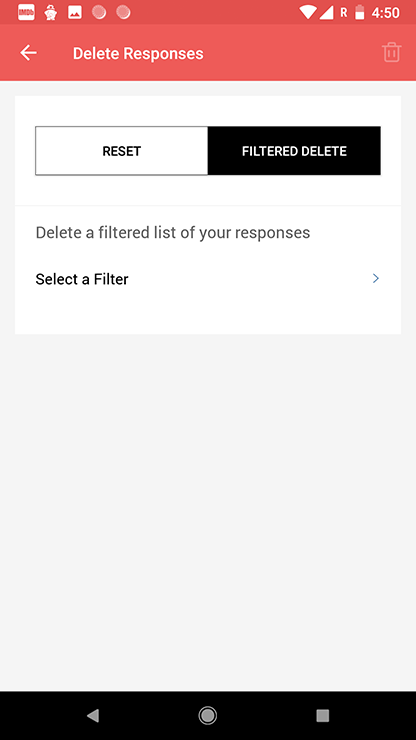 You can reset your survey by deleting all your responses, or by deleting a filtered list of responses. How do I bulk delete responses? Tap in the reports view, and select Delete Responses. Tap the type of deletion you want to perform. Tap Reset if you want to delete all responses the survey has collected. 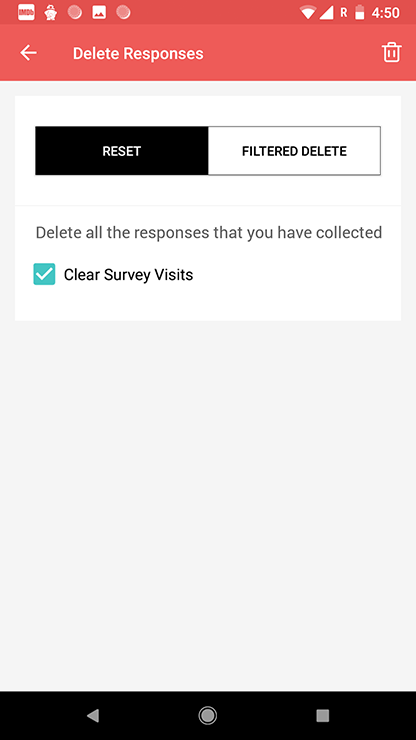 Uncheck the Clear Survey Visits checkbox if you want to clear the number of visits for your survey from your reports. Tap Filtered Delete if you want to delete a filtered list of responses. Tap Deletea filtered list of your responses and tap the filter you want to apply to your bulk deletion. Note: Deleted responses can't be recovered. Find surveys by typing keywords into the search bar on the All Surveys page. Apply filters to manage your search results. Tap and you can apply the following filters on the All Surveys page. Tap any survey and you will be directed to the summary of the survey. Surveys that are yet to be published will list the number of pages and questions in your survey, and the date on which it was created. 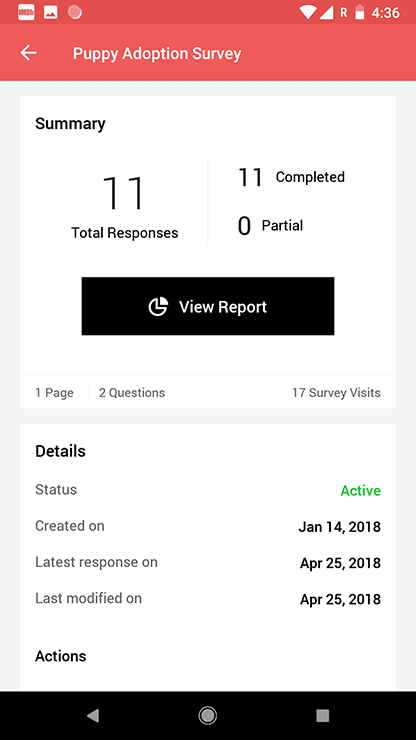 Published surveys will have the total number of responses, details on the number of completed and partial responses, and the number of pages, questions, and survey visits. It also lists out the status of the survey, latest response date, and last modified date.